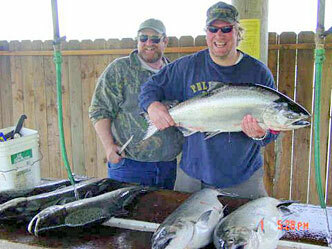 Oregon Spring Chinook Salmon are prized for their great eating qualities and are a top sport fish. 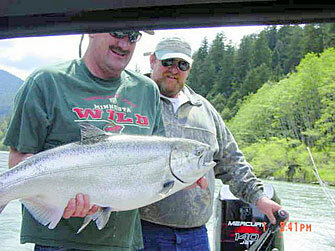 Oregon Spring Chinook are fresh in the spring months of mid March through June. Spring Chinook Salmon which avoid the dangers of life in the Pacific Ocean and the Sea Lion gauntlet at the rivers mouth, return to natal rivers, after three to four years at sea at 17 to 45 pound mint bright and fat adults. Only a few rivers have a Springer runs. The rivers that do have these prized salmon include the Umpqua and the Rogue Rivers. The Rogue River having the biggest run of Southern Oregon Spring Chinook Salmon although the Umpqua River produces good high quality catches. 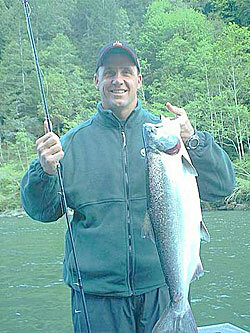 Both are large rivers during run-off and using one of our Oregon Spring Chinook Fishing Guides is recommended. Salmon fishing in the Lower River began in the 1870’s, and are the most prized tasting salmon. The Rogue Rivers Spring Salmon have even won the Worlds Fair for their eating quality. A Lower Rogue River Spring Chinook Salmon are only hours into their 150 mile migration and just out of tidal water. Fresh Springer’s from the ocean with a wild spirit that brings extreme excitement and joy from the fishermen along the Rogue who hookup one of these great fish. Down here Springer fishing is generally done from custom built Jet boats with canvas tops and heaters to meet the spring elements. When a Spring Chinook Salmon is hooked up all rods will be brought in and stored except the one with the screaming reel! Sometimes we will float down river hundreds of yards chasing the hooked Spring Chinook Salmon to find a place to land it in slower current. A limit of two Spring Chinook Salmon per angler is observed, but that means 35 to 60 pounds of Spring Chinook Salmon the best eating salmon you ever had to take home each day! The middle Rogue River section near Grants Pass fishing is for moving Spring Chinook Salmon. River water flows and fish movements are key to a success on Spring Spring Chinook Salmon fishing. Use on of our Fishing Guides for best sucess. The Upper Rogue River region where the Rogue Springer’s are migrating to. Here the Spring Spring Chinook Salmon slows its pace and begins to hold in cold deep pools until spawning time begins in mid September. A few areas are accessible by Jet Boat but the region is mostly Drift Boats with two anglers each. Areas drifted are from Cole Rivers Hatchery to Valley of the Rogue Park. This is about a 45 miles. 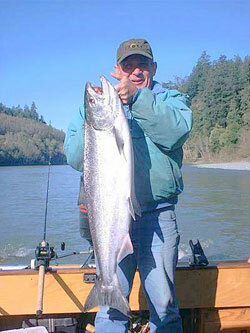 Methods used to for Spring Chinook Salmon fishing here are Back Trolling big plugs such as Quick Fish and Flat Fish wrapped with a rapper or back bouncing roe. Umpqua River Spring Chinook Salmon fishing in the Lower Umpqua near the town of Elkton down to tide water is the first to kick off and is dependant on higher water flows. Spring Chinook Salmon fishing with beautiful Umpqua River scenery. There is also some good success from the forks to Winchester Dam and good bank fishing at Rock Creek on the North Umpqua River.